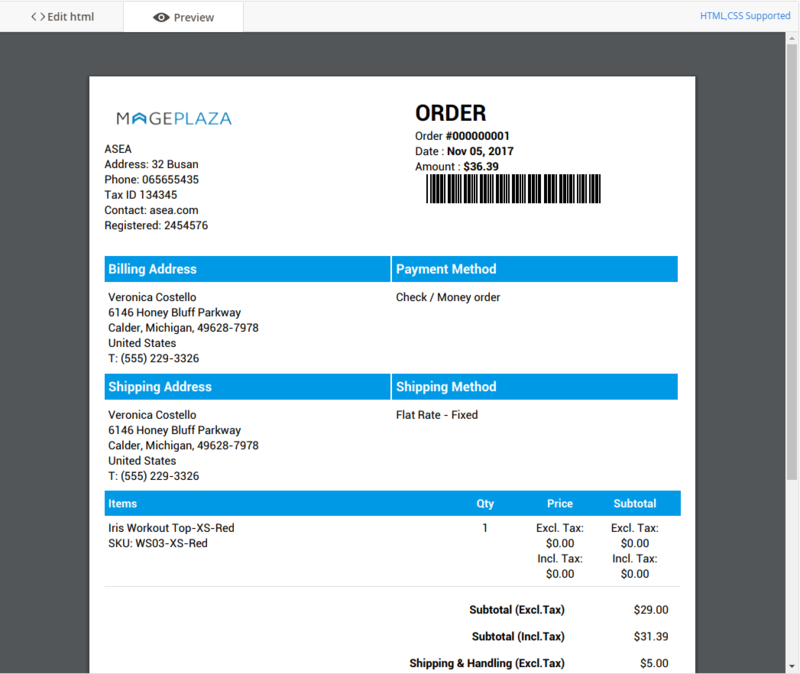 Mageplaza offers a solution to help customers easily print, download PDF Invoice, PDF Order, PDF Shipment, PDF Credit Memo quickly and easily with just a single click on the customer information page. To enhance user experience, PDF files are included in emails to customers. 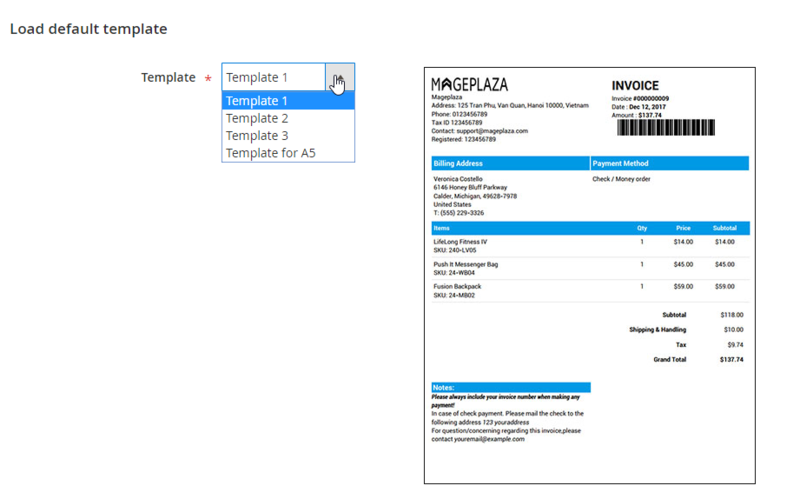 In addition, Mageplaza also adds the HTML edit feature so shop owners can customize their PDF files, and Preview function also allows them to take an overview look at the newly created design conveniently. Tick Use system value again to use “Enable PDF Invoice = Yes” as your default. If you leave it blank, the color of heading will be white. When you print the PDF in the backend, the color of heading will be the selected color in Store View > Default Config. While when you print the PDF in the frontend or send an email with a PDF attachment, the heading Color will display according to the configuration of that store. Choose “Yes” to display page numbers at the end of the PDF document. Check Use system value to set “Show Page Number = Yes” as default. When you configure it in Store View > Default Config, the page number is displayed/hidden when you print the PDF in the backend and when you preview the template. 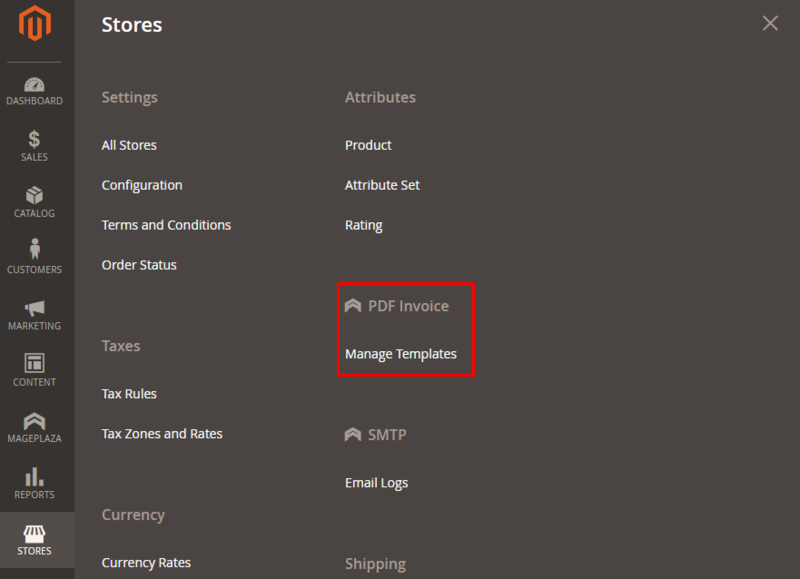 When you configure the store, the number of pages is displayed/hidden when you print the PDF outside of the frontend and in the PDF attached to the email. Specifically, when you print multiple PDFs at the same time, displaying the page number at the bottom of each PDF is the default. There are 4 kinds of paper size you can choose: A4, A5, A6, and A7. The design of PDF files works best with a A4 page size. When you print a PDF in the backend or when you create a template, the page size displays in Store View > Default Config section. 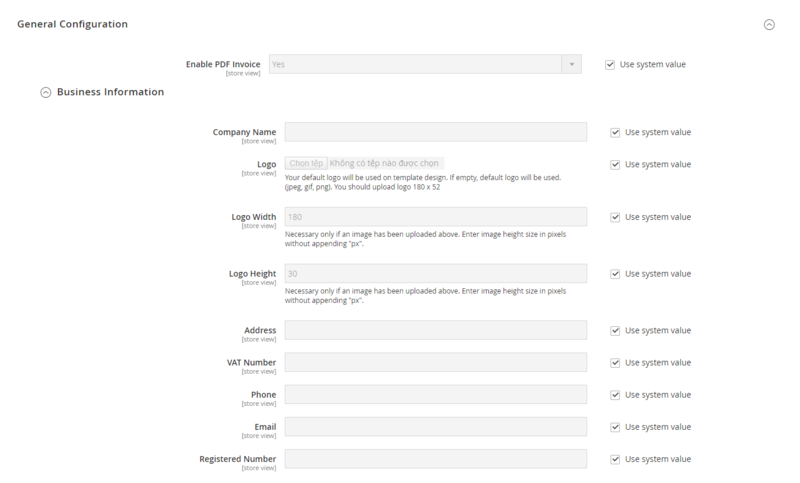 When you print a PDF in the frontend or send an email with a PDF attachment, the page size will display in the configuration section of the store. Uncheck the Use system value to configure the extension. Choose “Yes” to send the PDF invoice attached along with the email. Tick Use system value again to use “Enable PDF Attachment = Yes” as your default. Uncheck the Use system value to configure the extension. Choose “Template” to display the PDF file as in the selected template. 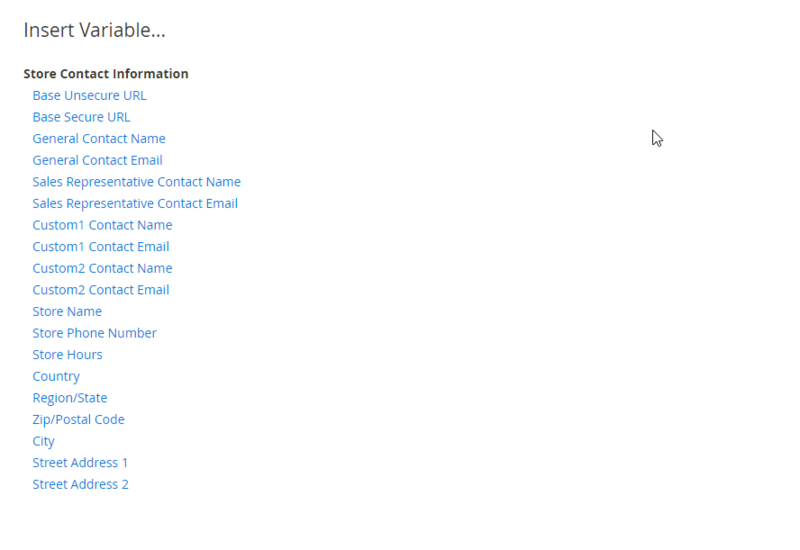 All your created templates will be displayed as a drop-down list in this section. Tick Use system value to use Select Template = Template 1 as the default setting. If store owners want to use the page size is A5, they should use the template for A5. As this template that we design servers for the page size for A5. In Note field: This is the place where you enter your note for the Order. HTML code can be use in here. Uncheck Use system value to configure this field. 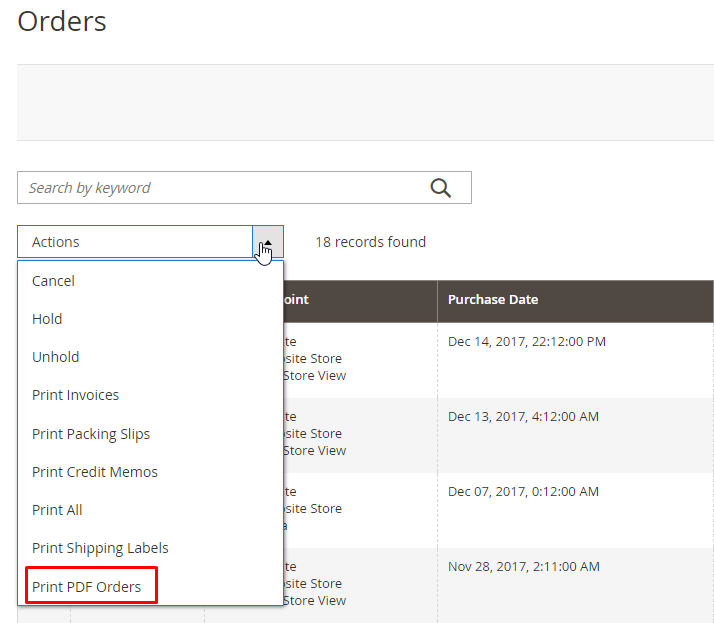 Show Custom Print Button = Both: This will display an additional Print PDF Order button in the backend’s Order and the frontend’s My order page. When customers click the Print PDF Order button, the designed PDF template will be downloaded automatically. Show Custom Print Button = Custom PDF: Show Print PDF Order at massAction This won’t display Print PDF Order button. The button will be combinated with Print button by Magento 2. When the button is clicked, the designed PDF template will be downloaded automatically. Show Custom Print Button = No: This won’t display Print PDF Order button. 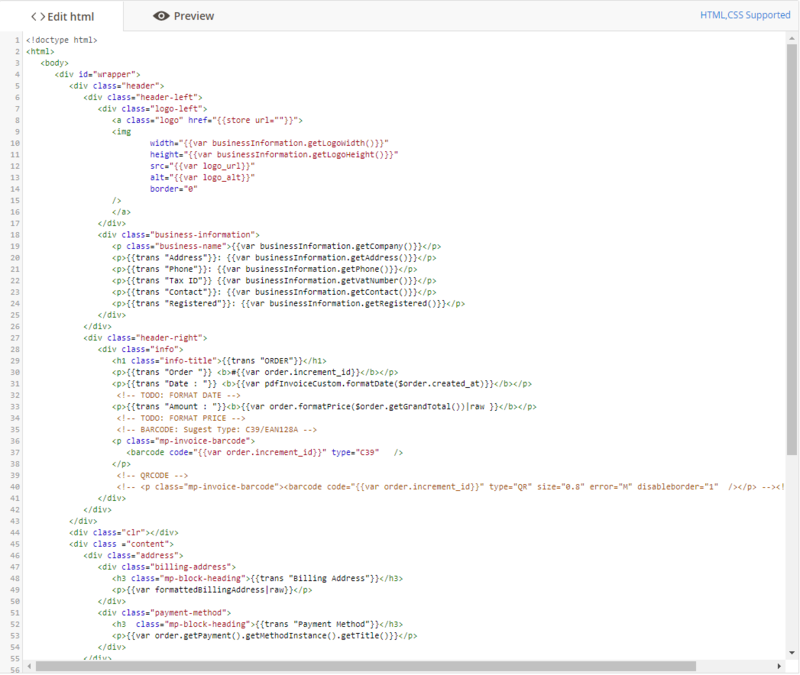 When the button is clicked at My Order page on the frontend, the file will be downloaded as the Magento 2’s template. Check Use system value to use “Show Custom Print Button = Both” as the default setting. Uncheck Use system value to configure the extension. Choose “Yes” to send emails along with the attached PDF invoice. Check Use system value to set “Enable PDF Attachment = Yes” as the default setting. Uncheck Use system value to configure the extension. Choose “Template” to display the PDF file as selected template. Check Use system value to use “Select Template = Template 1” as the default setting. 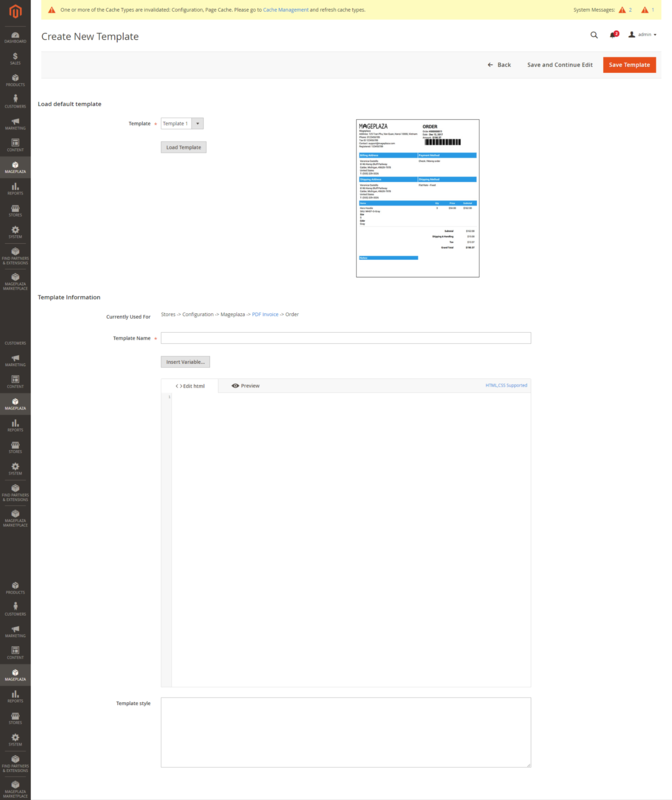 Show Custom Print Button = Both: This will display Print PDF Invoice button in the backend’s invoice and on the My Order page of the frontend. When clicking that button, the designed PDF template will be downloaded automatically. 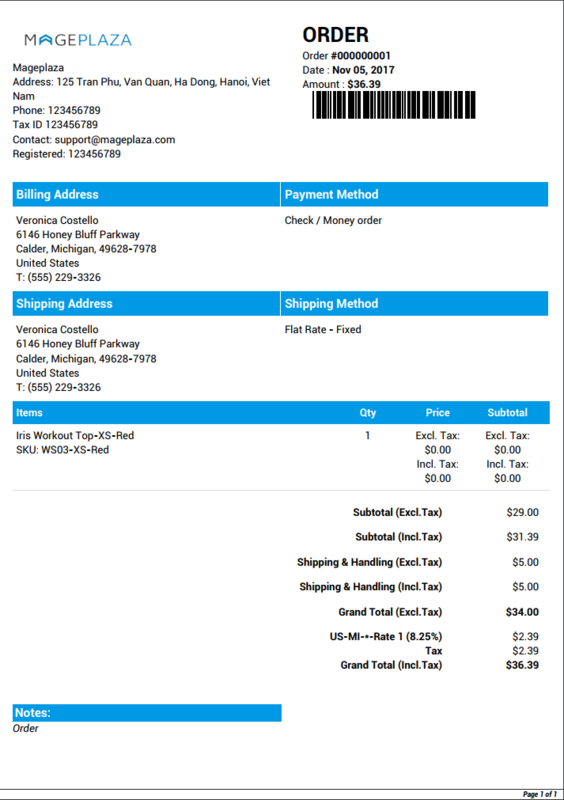 Show Custom Print Button = Custom PDF: This won’t display Print PDF Invoice button. The button will be combinated with Print button by Magento 2. When the button is clicked, the designed PDF template will be downloaded automatically. Show Custom Print Button = No: This won’t display Print PDF Invoice button. 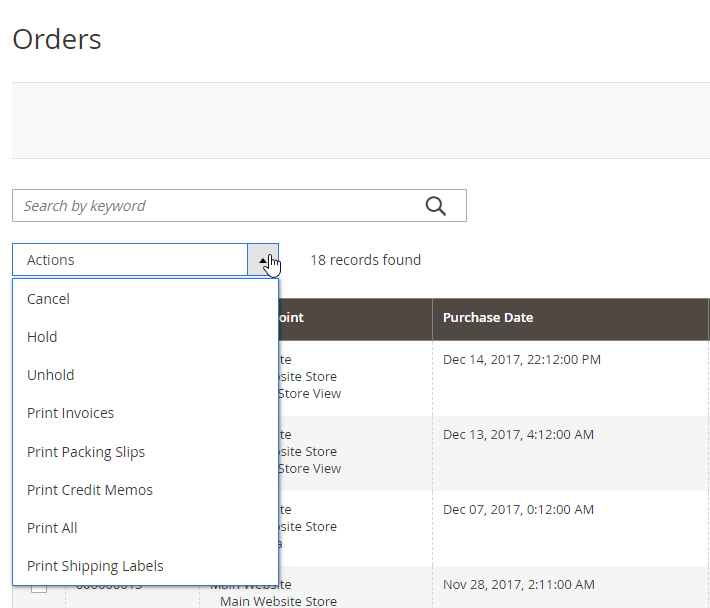 When admins click Print in the backend’s Invoice and customers click Print Invoice in My Order of the frontend, the order file will be downloaded as the Magento’s template. Show Custom Print Button = Both: This will display an additional Print PDF Shipment button in the backend’s Order and the frontend’s My order page. When customers click the Print PDF Shipment button, the designed PDF template will be downloaded automatically. Show Custom Print Button = Custom PDF: This won’t display Print PDF Order button. The Print PDF Shipment button will be combinated with Print button by Magento 2. When admins click Print of the Shipment (in the backend) or customers click Print Shipment (My account > My Order of the frontend), the designed PDF template will be downloaded automatically. Show Custom Print Button = No: This won’t display Print PDF Shipment button. 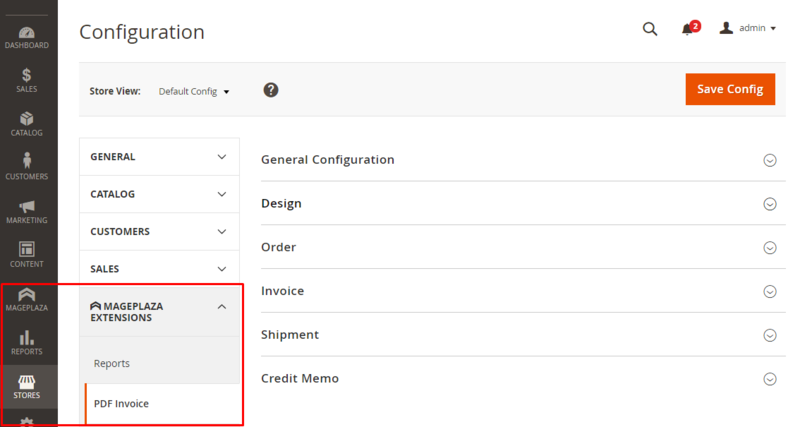 When admins click Printof the Shipment in the backend’s or customers click Print Shipment in My Order of the frontend, the file will be downloaded as the Magento 2’s template. In Note field: This is the place where you enter your note for the Order. HTML code can be used in here. Uncheck Use system value to configure the extension. Choose “Template” to display the designed PDF as in the selected template. Check Use system value to set “Select Template = Template 1” as default setting. Show Custom Print Button = Both: This will display an additional Print PDF Refund button in the backend’s Credit Memo and the frontend’s My order page. When customers click the Print PDF Refund button, the designed PDF template will be downloaded automatically. Show Custom Print Button = Custom PDF: This won’t display Print PDF Refund button. The Print PDF Refund** button will be combinated withPrintbutton by Magento 2. When admins clickPrintof the Credit Memo (in the backend) or customers clickPrint Credit Memo(My account > My Order`` of the frontend), the designed PDF Credit Memo template will be downloaded automatically. Show Custom Print Button = No: This won’t display Print PDF Refund button. When admins click Printof the Credit Memo section (in the backend) or customers click Print Refund in My Order (of the frontend), the file will be downloaded as the Magento 2’s template. In Note field: This is the place where you enter your note for the Order. HTML code can be use in here. Also, when you print in the massAction, store owners can print all PDF files of many different stores. 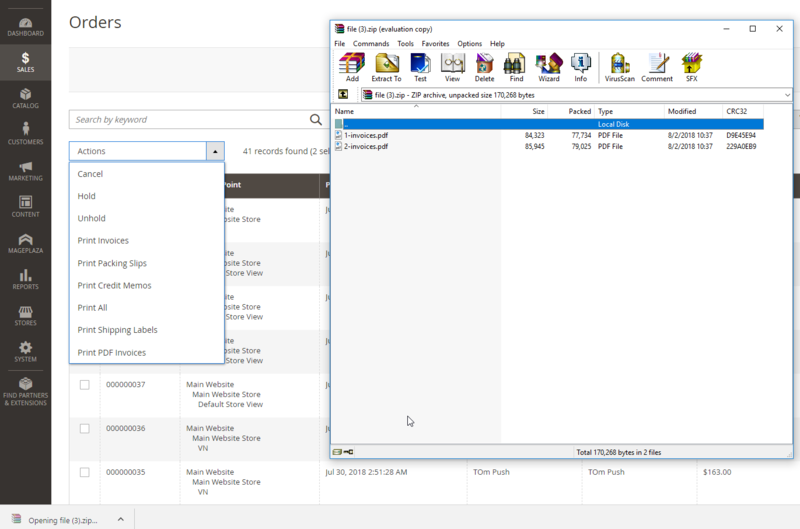 All this PDF files will display as the configuration of that store and the PDF files are extracted in the zip format. If you don’t choose a template form, the default template will be “Template = Template 1”. In the Order section, click Print PDF Order button to download the PDF Order. The downloaded PDF will have your designed template from previous steps you’ve done above. When you click Send Email, the sending email will be attached that PDF Order if in the 1.2. Order’s configuration, “Enable PDF Attachment = Yes”. Besides, when customers place a new order, stores will send that particular order billing to their emails. Your customers can preview and download to print this PDF Order instantly. When you create Invoice, Shipment or Credit Memo, if you check the “Email Copy of Invoice”, “Email Copy of Shipment” or “Email Copy of Credit Memo” box, the sent mail will also include the PDF file. Similar to the Order section, Invoice, Shipment or Credit Memo PDF files will be attached to the sent mail, or when customer click Print button, the PDF file will be downloaded automatically. With the virtual product’s Order, in the PDF Order, PDF Invoice, PDF Credit Memo, there won’t be included Shipping To, Shipping Information or Shipment Method section.